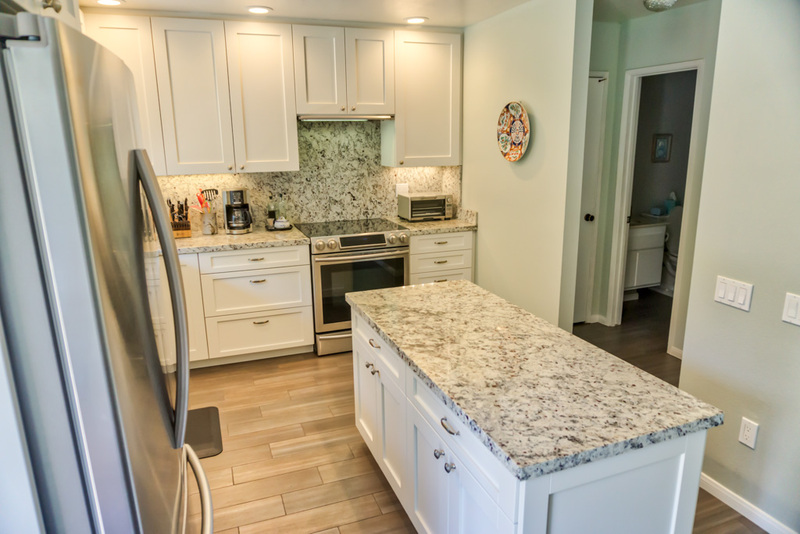 Added island to kitchen with 33” tall counter tops for this short homemaker who does a lot of baking. This island is where she does all here pastry work. Island has role out shelves for easy access storage of pots and pans. Added adjustable shelving and tray divided storage to adjacent hall closet making it into a pantry. Adding island moved dining table a little further from kitchen and closer to the family room. Cabinet Door Style:Custom Recessed Panel door made to look like Mission Style door with 3” frame and light v-groove in frame joints. 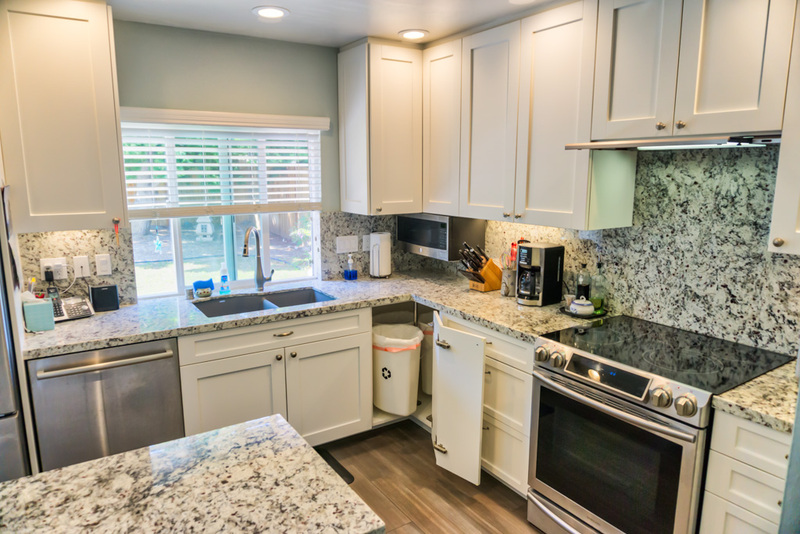 This kitchen had its original 1960’s track home builders kitchen with sink, range and fridge so close together there was little counter work space and very poor access to storage with dead corners. 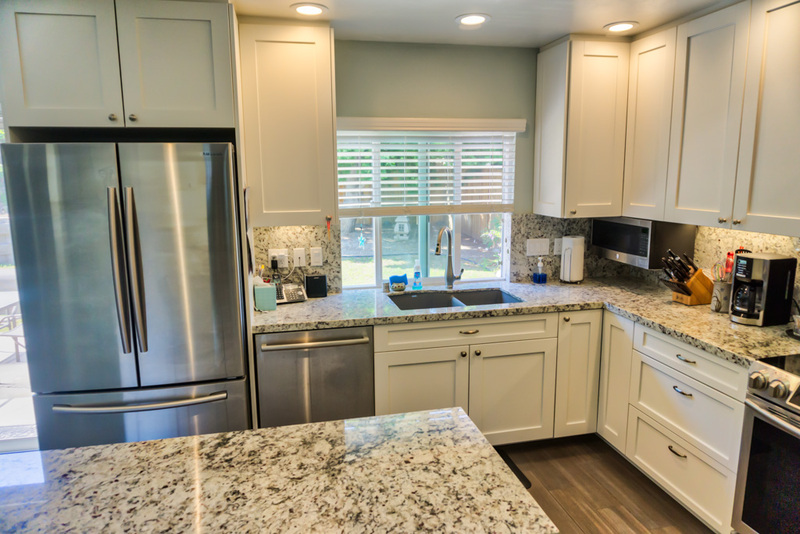 The homeowner was referred to me by friends and family I had worked with through the years. 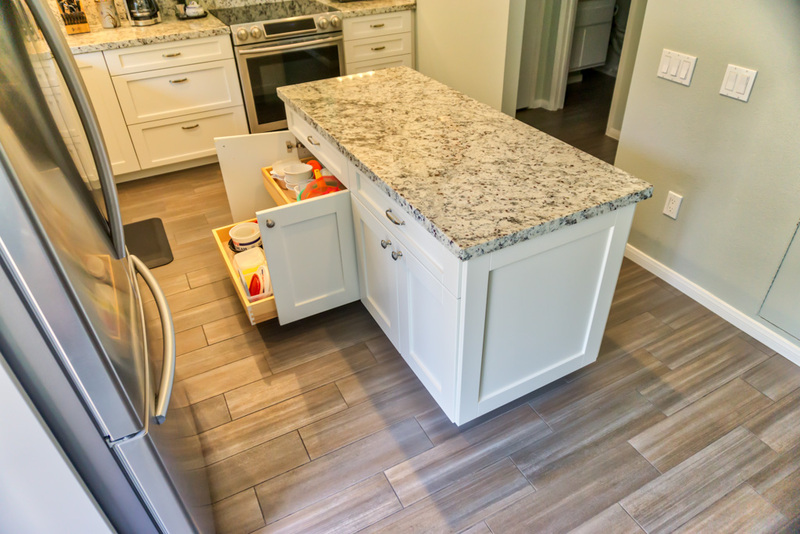 Her objective was to get more counter space and storage while also creating some lower counter space for her as a baking prep center, since she is shorter than average. 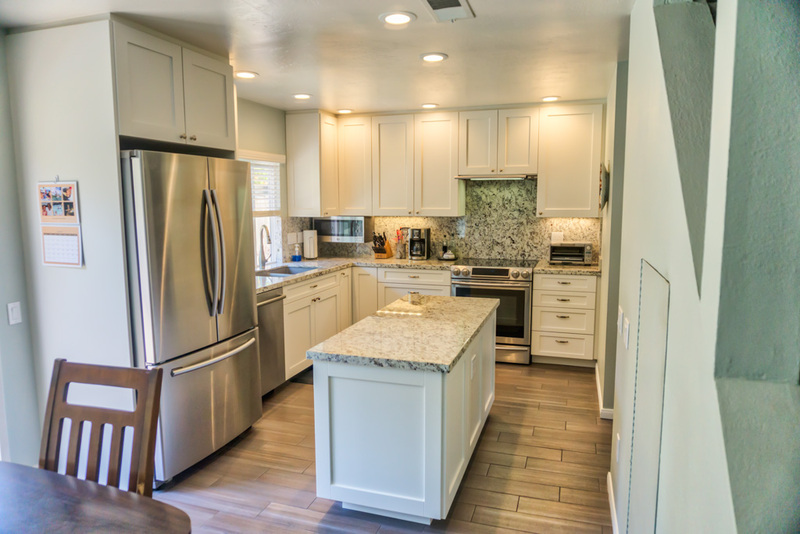 The original kitchen was just the L-shaped area with the fridge and sink on the window wall and the range on the adjoining wall completing the L. The original builder left a space of about 24” between the sliding glass door to the patio and the fridge. We moved the fridge 18” closer to that door, which made the L shape portion of the kitchen larger. This created more wall and base storage, and opened the corner space for a large 3 bin recycle center instead of the original dead corner. 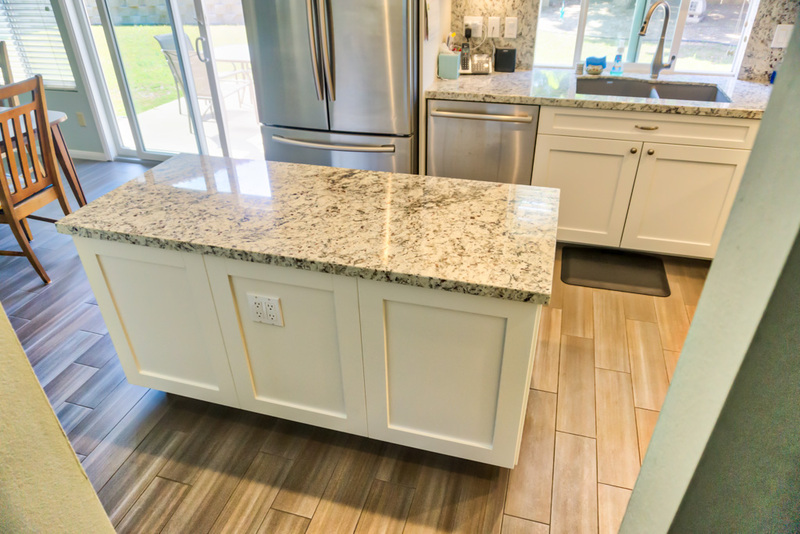 We also added the island for more storage and lowered the height to a 33” counter space this client wanted for her baking prep area. The move of the fridge closer to the door would have encroached into the original dining area’s seating if we had not also added the island. 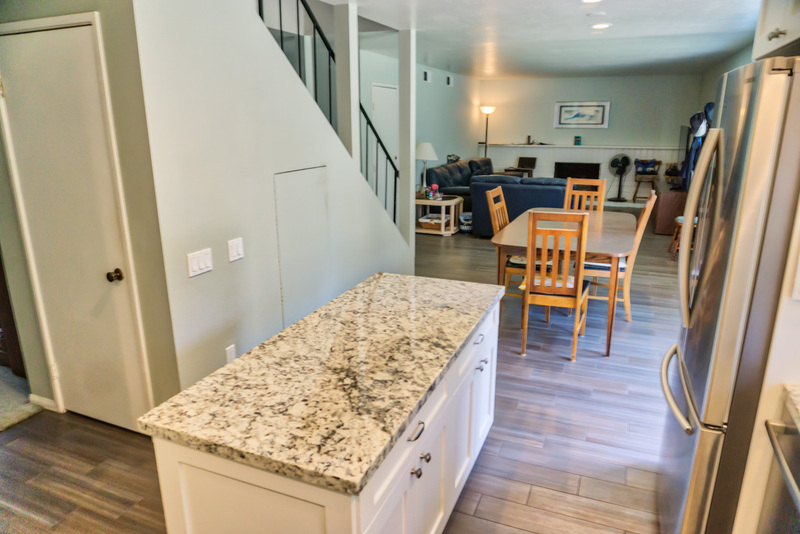 Adding the island forced us to move the dining area closer to the family room. 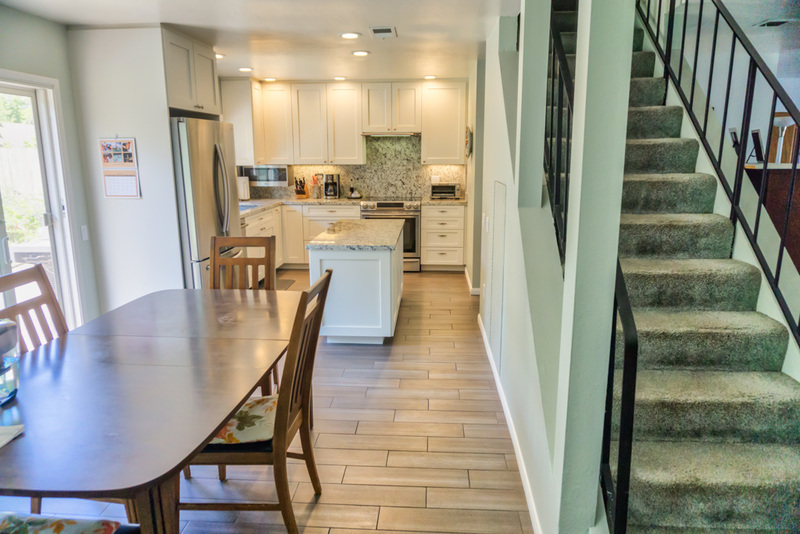 The new configuration actually looks more like it should have been that way in the first place because they originally had an unusually big walkway between the dining table set and the family room. Now the walkway is a more normal size, and everything looks like it’s in good proportion. 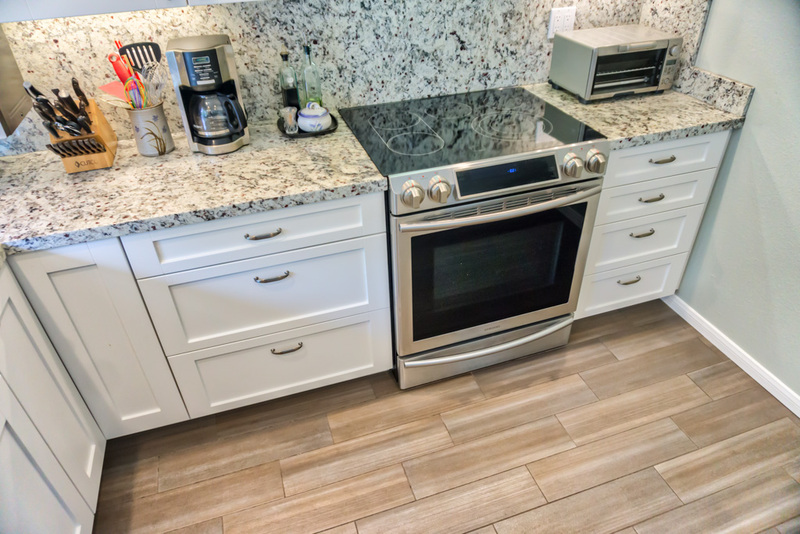 When considering lower counter space it is important not to consider it at the sink- dishwasher or the range areas because those appliances are made for the 36” standard counter height and can have their height reduced. Islands are ideal for baking centers because if they are small enough, one can work from both sides of the island, which is handy when rolling or stretching very thin pastries. 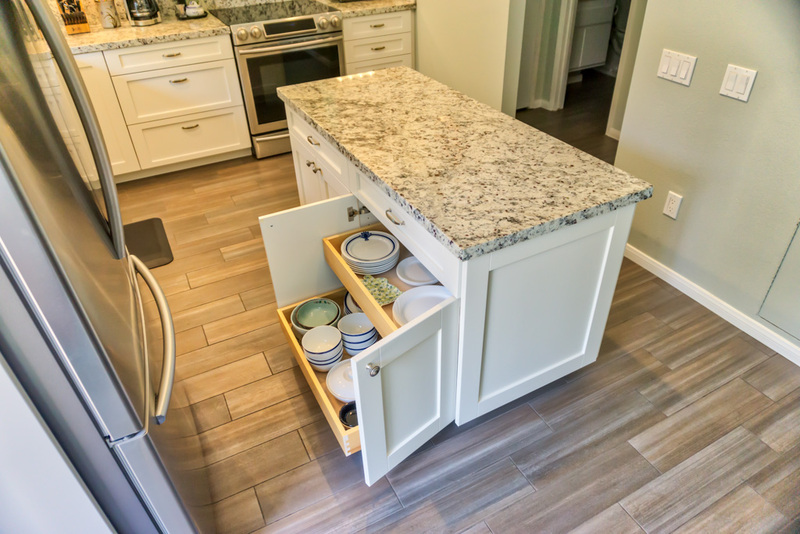 The island also adds some much needed large roll-out shelves for pot and pan storage. 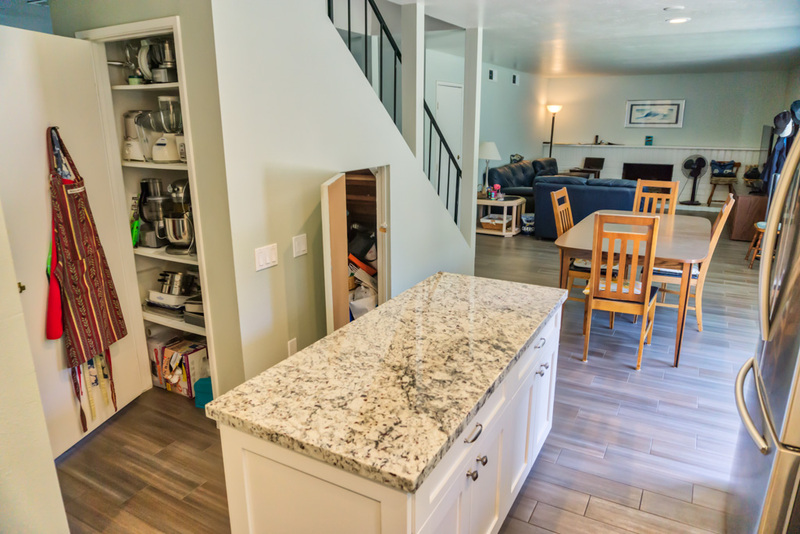 We also added storage by creating a pantry with adjustable shelves, and tray dividers out of the closet under the stair, just off the kitchen island. They have an existing hidden door access to another storage area under the shorter part of the stairs for storing things they don’t need to access often. Notice that on one side of the range we have a 3 drawer stack and a 4 drawer the other. The photos of what is inside of the 3 drawer is a good example of the kind of things that those taller drawers are good for. In this case, she put all her baking supplies in self seal containers that perfectly fit that tall space. 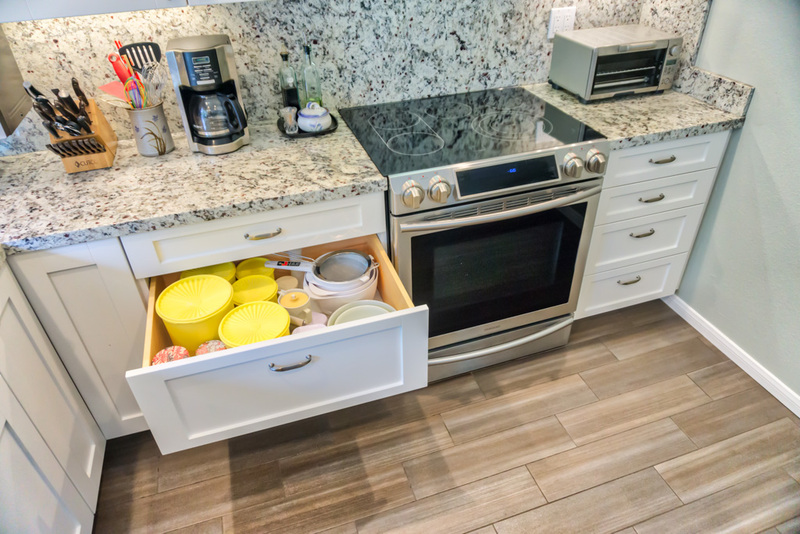 Shorter height 4 drawer stacks are better for storing shorter items or thin items like towels and place mats that stack. We installed a wood look porcelain tile flooring throughout the kitchen, dining area and out to the front door entry. 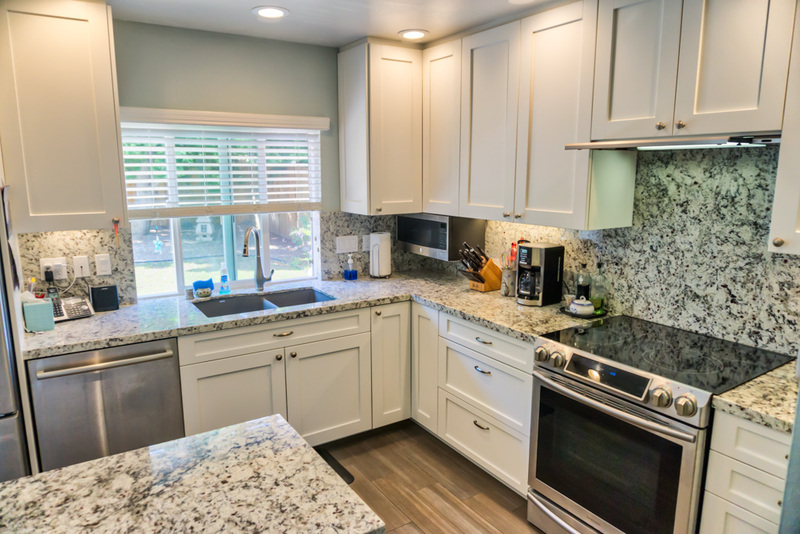 This kitchen is another example of how to make the same size space work, look, and feel bigger than it was before just by making better use of the available space. 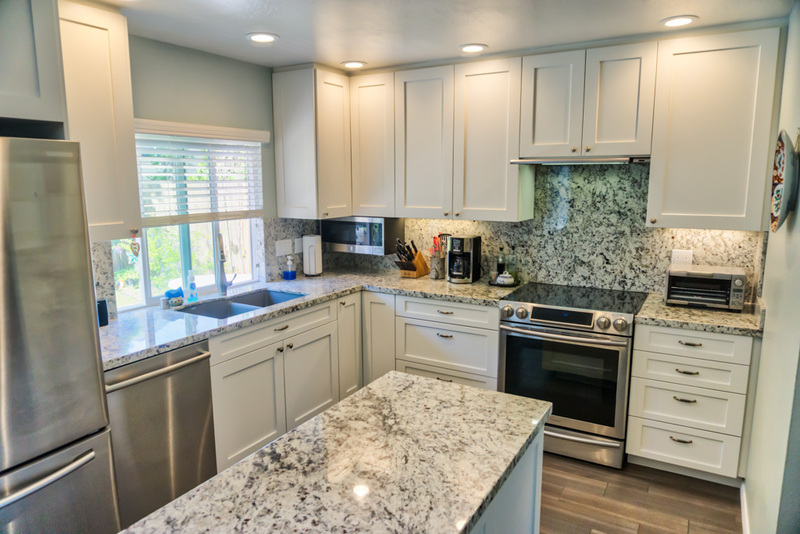 We all know home-builders are not known for making the best use of the space in their homes, they are known for spending as little as necessary to sell the home. This original kitchen and our improvements of the same space are a great example of that.